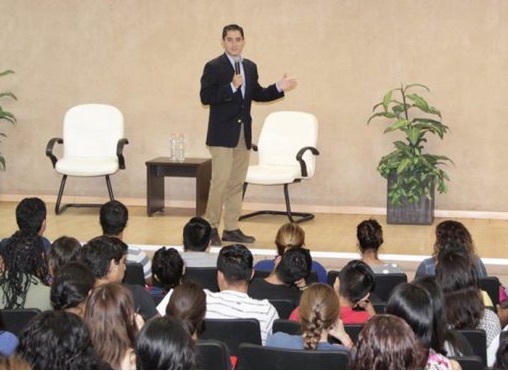 The Autonomous University of Tamaulipas (UAT) is offering its students the conference “Mediation for a culture of peace”, in which young people are introduced to a broader perspective of the subject, as well as tools essential for conflict resolution. The lecture was given by the Master Jose Ives Soberón Mejía, in the auditorium of the Academic Unit of Social Work and Sciences for the Human Development (UATSCDH) of the Victoria Campus. “Sometimes we think it is a subject foreign to us but there are many conflicts to solve in our university, in our community, and in all social spheres,” said the speaker, who has a Master’s Degree in Conflictology with Specialty in Family and Educational Mediation by The Universitat Oberta de Catalunya. The UAT professor also stressed the importance of addressing the issue of mediation in the University, which allows the dissemination of tools and peaceful ways to resolve conflicts among young people. “Throughout our life if there is something that we can not escape, it is the issue of conflicts. And when there comes a conflict in our life we ​​tend to solve it as it occurs, without benefiting by gaining a general scheme for conflict resolution, “he said. He stressed that this is why the effort made by the University is praiseworthy, in order to instill in young people the tools to resolve conflicts in a systematic way. “That is why mediation gives us the tools to solve conflicts and this in turn contributes to the culture of peace,” he concluded.